L3 Narda-MITEQ has set the standard as a supplier of "state-of-the-art" products. Following this tradition, we have attempted to offer one of the most advanced and comprehensive website's in the industry, featuring over one million product specifications covering our complete line of components and systems, including outline drawings, test data and a wide assortment of technical application notes. L3 Narda-MITEQ is committed to supporting our customer base and will make every effort to offer as much up-to-date and useful information as possible in the hope that this website will become a valuable benefit to our customers. 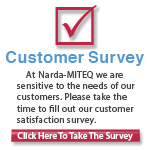 What new products you would like to see L3 Narda-MITEQ develop? How can we improve our current product line? How responsive are our engineers to your inquiries? What information do you find most useful on this site? What do you find confusing about this site? Non working links, let us know!